IDC recently updated an analysis of the challenges and opportunities associated with the support and operation of mission-critical business processes. Key to the analysis was an in-depth exploration of the business value derived from using Hewlett Packard Enterprise's Datacenter Care (DC) Service to ensure reliable operations and optimization of IT resources in support of business processes. Using this service to ensure uninterrupted, reliable operations of today's 24 x 7 IT infrastructure carries measurable benefits across the enterprise. 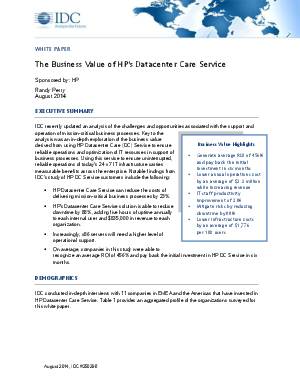 Download this white paper to learn more about these notable findings from IDC's study of Hewlett Packard Enterprise DC Service customers. Hewlett Packard Enterprise Datacenter Care Service can reduce the costs of delivering mission-critical business processes by 23%. Hewlett Packard Enterprise's Datacenter Care Service solution is able to reduce downtime by 88%, adding five hours of uptime annually to each internal user and $835,000 in revenue to each organization. Increasingly, x86 servers will need a higher level of operational support. On average, companies in this study were able to recognize an average ROI of 456% and pay back the initial investment in Hewlett Packard Enterprise DC Service in six months.